(also Neocene), the formation (system) of layers of rock deposited in the next to last period of the earth’s geological history. The Neogene system (period) belongs to the Cenozoic erathem (era); it follows the Paleogene system (period) and precedes the Anthropogenic system (period). Using radiological methods, it has been determined that the Neogene period began 25 million years ago and that its duration was more than 23 million years. The Neogene system is divided into two units (epochs), the Miocene and the Pliocene, which were established by the British geologist C. Lyell in Italy in 1833. The name “Neogene system (period)” was proposed in 1853 by the Austrian geologist M. Hoernes. The studies of the Russian scientist N. I. Andrusov (between 1882 and 1917) were fundamental for knowledge of the Neogene system in the southern part of what is now the USSR. The results of these investigations are the basis for the strati-graphic division of the Neogene in the USSR. They have been supplemented and elaborated by Soviet scientists, including V. P. Kolesnikov, B. P. Zhizhchenko, A. G. Eberzin, and R. L. Merklin. 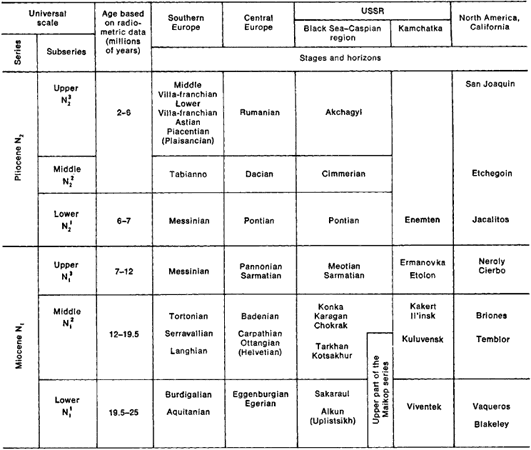 The Neogene system of the Far East has been studied by L. V. Krishtofovich and others. Studies of the Neogene abroad have been made by the Bulgarian scientists P. Gochev and E. Koen, the Frenchmen C. Deperet, G. E. Haug, and M. Gignoux, the Austrians M. Neumayr and M. Schaffer, the Hungarians K. Krejci-Graf and L. Lóczy, and the Rumanians E. Jekelius and S. R. Ciocârdel. The stratigraphy of the Neogene in the regions of the Pacific and Atlantic oceans has been studied by H. Finlay (New Zealand), R. Kleinpell (United States), H. Bolli (Switzerland), and W. Blow (Great Britain). which are composed of sands (Astian), are found beyond the valleys over more extensive areas. Many volcanic strata are observed in the Pliocene in Italy and Greece. Sedimentation occurred in the depressions of Central Europe during the Middle Miocene, when the basins had only minor connections to the sea. At the end of the Miocene, the basins were separated and formed brackish lagoons and lakes. The Sarmatian fauna of mollusks developed in these bodies of water, followed later by the Pannonian and Pontian fauna. At one time, there was an isolated basin in the southern USSR, in the Black Sea-Caspian region, which was separated from the world ocean by a ridge of mountains that appeared at the end of the Paleogene; the basin was sometimes connected with the ocean. The Lower Miocene and lower strata of the Middle Miocene are represented there by the upper part of the clay strata of the Maikop series, which accumulated in a very large basin cut off from the ocean. The overlying strata are represented by deposits that are brackish marine (the Tarkhan and Chokrak stages) or freshwater (the Karagan stage) and then marine again (the Konka stage). The Upper Miocene is composed of formations of the freshwater Sarmatian Lake and of marine deposits of the Meotian stage. In the beginning of the Pliocene, the area that is now the Black Sea and the Sea of Azov was the site of the brackish Pontian, later Cimmerian, Lake, which was cut off from the Caspian; the Caspian survived in this epoch as a small body of water in the southern section of the depression. The last large transgression of the sea occurred at the end of the Pliocene (Akchagyl age), and the sea became connected with the ocean. Along the deep valleys of the Volga and other rivers, the Akchagyl Sea penetrated deep into the East European Plain (to the Kama River) and into the Caucasus, leaving deposits resembling those of the Plaisancian of Western Europe in the conditions of bedding. Continental and thick volcanic Pliocene beds are found in the Caucasus. In Southwest Asia the beds that accumulated in the depressions were primarily continental. These beds are especially thick in Baluchistan and the Himalayan foothills (the Siwalik Mountains), where they contain bones of Neogene mammals and other animals. In Indonesia the Neogene system is represented by a thick complex of marine and continental deposits, among which there are volcanic beds. By comparing various mollusks, foraminifers, and for the continental beds, vertebrates it has been possible to identify there all the main subdivisions of the Miocene and Pliocene, which correlate with the European ones. Neogene marine deposits are distributed along the entire periphery of the Pacific Ocean. They make up the thick sedimentary-volcanogenic beds of Kamchatka and the Kuril Islands and the sedimentary beds of Sakhalin, Japan, the Philippines, southern Alaska, and the coasts of California and Mexico. Significant Neogene beds are found in Central America on the Caribbean islands, in Venezuela, and elsewhere. Their stratigraphy is based on the types of marine coastal mollusks and foraminifers. Study of the Neogene deposits on the floor of the seas and oceans was begun in 1968 using material from deep-sea drilling. Neogene sediments have been revealed by boreholes in the Atlantic, Pacific, and Indian oceans and in the Mediterranean Sea. At depths of 3,500–4,000 m in the tropical, subtropical, and temperate climatic zones, Neogene deposits are represented by calcareous silts consisting of planktonic microorganisms (foraminifers and nannoplankton). In the abyssal plains, which are located at great depths, Neogene deposits are represented by pelagic red clays containing Radiolaria. In the boreal regions—the Bering Sea, the Aleutian Islands, and Antarctica—Neogene deposits consist of diatomaceous ooze and clay and of marine glacial deposits. Volcanogenic-sedimentary rocks (Pacific Ocean), gypsums (Mediterranean and Red seas), and turbidites (Pacific and Atlantic oceans) are also found in Neogene deposits. General description. In the Alpine folded region of southern Europe and Southwest Asia, the end of the Paleogene was marked by the beginning of the orogenic stage, during which many mountain ranges were uplifted (the Alps, Carpathians, Balkans, Dinaric Alps, Apennines, Caucasus, Crimea, Pontic and Taurus mountains, Zagros, Baluchistan, Himalayas). The growth of the mountains was accompanied by the formation of intermontane and marginal troughs that sagged considerably and filled with products of water erosion from the growing mountains (molasse). As a result of movements of the earth’s crust, the sedimentary beds underwent folding. At the same time, major intrusions of granites occurred. Magma penetrated to the surface along fractures, pouring out in the form of lava sheets and forming volcanic cones. The principal centers of volcanic activity were the Italian Peninsula, Asia Minor, the southern Balkan Peninsula, and the Caucasus. At the end of the period, the deep troughs of the internal seas formed—the Ligurian, Tyrrhenian, Ionian, Black, Caspian, and Adriatic seas and the Sea of Marmara. All these seas have relatively steep sides and flat bottoms. Geophysical studies show that there is no metamorphic granitic crustal layer beneath them and that the basaltic layer lies directly under the sedimentary beds. In the structure of their bottoms, they resemble oceanic troughs. In Indonesia underwater ridges were uplifted and became chains of islands; the deep geosynclinal depressions and troughs of the neighboring seas formed. On the periphery of the Pacific Ocean along the margin of the continents, mountain systems were also uplifted (the Cordilleras, Andes, Kamchatka, Japan, the Philippines, New Guinea, and New Zealand), the island arcs grew, and deep trenches and basins formed. During the Neogene period, intense movements were also observed beyond the active zones of the periphery of the Pacific Ocean and the Mediterranean belt of Eurasia; they were expressed in many parts of the continents in the uplifting of mountain blocks and the subsidence of the depressions separating the continents. It was at this time that the mountains of Central Asia formed: the Tien-Shan, K’unlun, Altai, Saians, Baikal Region, and the Stanovoi Range. Weaker uplifts were also experienced by the mountains of Scandinavia, the Atlas Mountains, the Urals, the Appalachians, and the mountains of eastern Australia. At the same time, in the two active zones of the continents, within Africa and Asia, deep rift depressions of the earth’s crust and the uplifts bounding them formed along the fractures. They constitute the graben system around Lake Baikal, the Angara River, and the Barguzin River and the graben system of East Africa and the Red Sea. Movements along the fractures of the latter system were accompanied by earthquakes and powerful manifestations of volcanism, which are expressed in the enormous cones of active volcanoes (Mount Kenya, Kilimanjaro) and extinct volcanoes with large fields of tuffs and lavas. Similar but less spectacular was the formation of the graben of the Rhine Valley, which was accompanied by volcanism. Rift depressions also formed in the axial parts of the midocean ridges in all the oceans and were also associated with intense volcanism and earthquakes. Owing to the extreme ruggedness of the relief, Neogene deposits formed partly in separate, more or less isolated basins. This accounts for the great diversity in the lithological composition of the basins and for the diversity of the organic remains. In the central parts of the continents, Neogene deposits are widely distributed and represented by relatively thin strata of continental sediments. Only in the foothill and intermontane basins do the sediments sometimes reach enormous thickness, measuring up to several kilometers. The sediments consist mainly of sands, sandstones, clays, marls, and organic limestones, as well as of thick pebble beds and conglomerates at the bases of the mountains. Rocks containing brown coal are found in some places. In the arid regions, thick beds of gypsum, potassium salt, and other salts accumulated. Glaciers and ice cover formed in the northern mountainous regions at the end of the Neogene. In Antarctica, they appeared at the beginning of the Neogene period. The present outlines and basic relief of the continents and oceans formed during the Neogene. The climatic zones, the flora, and the fauna were also similar to those of modern times. Organic world. Most of the genera and many species of Neogene plants, especially Pliocene plants, exist today, although in many cases their geographical distribution has changed. In the early Neogene the climate of the northern hemisphere was warmer and more humid than it is now, but it gradually became more like the climate of today. Broad-leaved forests were dominant in Siberia, and palms, laurels, and myrtles grew in comparatively high latitudes in Western Europe. By the end of the Neogene, Siberia was covered by taiga, although English walnuts continued to grow along the river valleys. In Western Europe by the end of the Neogene, evergreen forms were pushed back to the shores of the Mediterranean Sea and replaced to the north by deciduous and coniferous forests. The processes of gradual cooling and increasing aridity of the climate are established on the basis of fossil flora from the northern and southern hemispheres. The fossil flora of the tropical zone differed very little from that of today. Steppe and desert vegetation very similar to modern vegetation existed on the plains of Middle Asia and Kazakhstan from the beginning of the Neogene. The beginning of the Neogene in Europe was accompanied by abrupt changes in terrestrial fauna. Marsupials, the ancient predatory creodonts, and many groups of primitive ungulates became extinct. They were replaced by members of many new families, most of which exist today: ancient species of bears, badgers, and hyenas, the first proboscideans (mastodons and dinotheres), the ancestors of horses (anchitheres), and the first suids, antelopes, deer, bovids, sheep, and anthropoid apes. In particular, the ape ancestors of man first appeared. Their fossil remains have been found in the continental deposits of the Upper Miocene in North Africa and the Pliocene of the East African Rift Zone. New genera of insects and rodents appeared (for example, jerboas). In the early Neogene the mammals of North America developed in isolation and showed significantly less diversity. In the middle of the Neogene (the Upper Miocene) a land connection formed between the continents of Europe, Asia, and North America, probably in the vicinity of the Bering Strait; this led to large migrations of mammals and to the further development of these animals. At this time, vast areas of Europe and Asia had a uniform steppe-type fauna, whose most characteristic member was the hipparion, the three-toed horse. Somewhat younger Neogene deposits contain the most ancient remains of weasels, wolverines, true horses, and elephants. The end of the Neogene in Europe saw the disappearance of many genera of animals that exist today, however, in tropical countries. Throughout most of the Neogene period, South America was an isolated continent on which a unique fauna, completely unknown in the northern hemisphere, developed consisting of giant edentates, marsupials, ungulates, rodents, and platyrrhines. Only in the middle of the Pliocene was a connection established between South and North America, and the more highly developed mammalian fauna of North America penetrated South America and rapidly began supplanting local forms, only a few species of which have survived. Australia was isolated from the beginning of the Paleogene, and marsupials developed there, sometimes reaching giant size. Among the marine fauna of the Neogene period, the bivalve mollusks, gastropods, and foraminifers were especially abundant and diverse. Almost all of their genera and many of the species still exist. Unique bivalve mollusks and gastropods developed in the enclosed and semienclosed occasionally freshened seas and large freshwater basins in the southern part of what is now the USSR. Their study has made it possible to work out the stratigraphy of Neogene deposits in great detail. The foraminifers and ostracods are also very important for stratigraphy. Minerals. The most important mineral of the Neogene system is petroleum. Large petroleum deposits in the USSR (Azerbaijan, Turkmenia, parts of the Northern Caucasus, Sakhalin) are associated with the thick deposits of intermontane and foothill basins, as are those in Rumania, Iraq, Iran, Saudi Arabia, Burma, the Malay Archipelago, the United States (California and the northern coast of the Gulf of Mexico), southern Mexico, Venezuela, Colombia, and Argentina. Combustible gases, brown coal, and salts (gypsum, rock salt, and, in some places, potassium salts) have also been found in Neogene deposits. In many folded mountain ranges, deposits of copper, arsenic, lead, zinc, antimony, molybdenum, tungsten, bismuth, and mercury ores are associated with intrusions of igneous rock. Large deposits of sedimentary iron ores on the Kerch’ Peninsula are found in Pliocene beds. Many bauxite deposits in the tropical zone (Jamaica, Guyana, Surinam, Ghana, Guinea) formed in the Neogene period. Andrusov, N. I. Izbr. trudy, vols. 1–4. Moscow, 1961–65. Kolesnikov, V. P., B. P. Zhizhchenko, and A. G. Eberzin. Stratigrafiia SSSR, vol. 12: Neogen SSSR. Moscow-Leningrad, 1940. Gladenkov, Iu. B. Neogen Kamchatki. Moscow, 1972. Krasheminnikov, V. A. Stratigrafiia miotsenovykh otlozhenii Sredizem nomor’ia po foraminiferam. Moscow, 1971. Chumakov, I. S. Pliotsenovye i pleistotsenovye otlozheniia doliny Nila v Nubii i Verkhnem Egipte. Moscow, 1967.